During World War I, Moina Belle Michael pitched in by delivering reading material to the troops and volunteering for the Red Cross, but she wanted to do more to help American soldiers. Her age prohibited her from traveling overseas to support and feed soldiers on the battlefield, so Moina helped troops at home before they shipped off to war. One day Moina was deeply moved after reading the poem, We Shall Not Sleep" about Flanders Field. "The poem was 'most strikingly illustrated in color.' Spirits of soldiers floated about the battleground covered in white crosses and bright red poppies. There were no names on the crosses. No memory of who rested beneath the red poppies. And Mona knew what she had to do." She went out and purchased red, silk poppies and encouraged everyone to wear poppies as a way of remembering soldiers who had died in war. Eventually veterans' groups "adopted the poppy as their memorial flower, and the message traveled overseas." 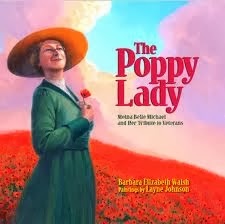 The Poppy Lady is a touching story of how the actions of one woman had a impact on soldiers across the world. The oil painting illustrations bring a nostalgic feeling to the story. Read aloud The Poppy Lady with children on Veterans' Day. A portion of the proceeds from book sales will benefit children of the U.S. Military. This is a wonderful book to read any time, but especially this week as we honor those who have served. The Poppy Lady is a lovely gift for children or senior citizens. It is also a fine book to present to a library in honor or in memory of those who served. Moina never stopped wanting to do more. What an admirable work ethic!